Google took another major step forward in positioning Google Apps as a document publishing platform. Google has added the ability to to see visual pages on your screen, also known as pagination. 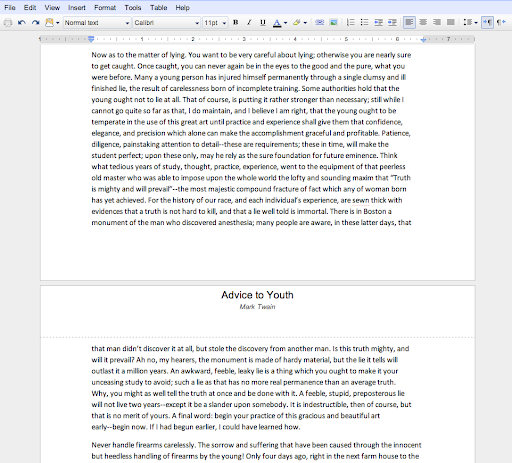 Pagination adds visual page breaks when editing Google Documents, which make the document editor much more familiar to users who have worked in Microsoft Word. Pagination also changes what's possible with printing in modern browsers. With native printing, you can print directly from your browser and the printed document will always match what you see on your screen. Native printing is only available in Google Chrome, and will be rolled out in other browsers in the near future. Pagination and native printing help the Google Apps environment become a viable commercial printing and publishing platform.